Several people have said how nice it would be to have a regular social event. So we’re going to hold monthly movie nights at a local pub on the second Tuesday of the month, where people can eat, drink and discuss a movie. 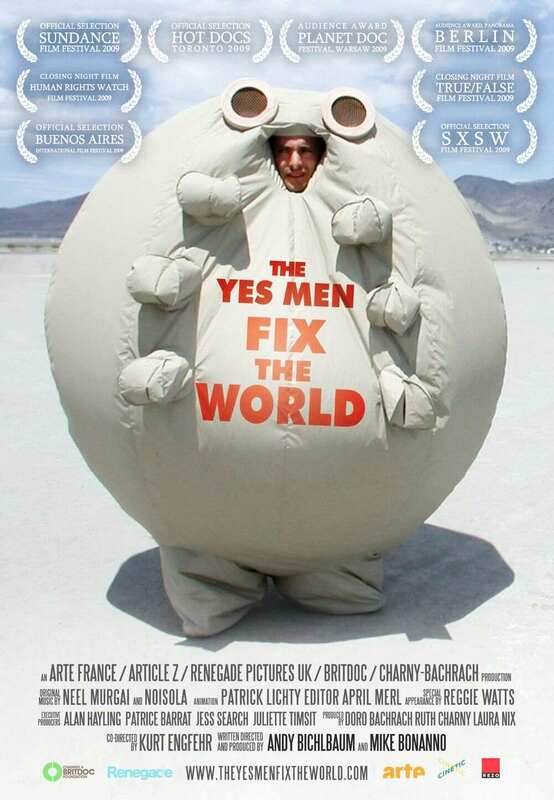 Our second movie will be ‘The Yes Men Fix the World’ on Tuesday 13th August. Please join us for food and drinks at the Stirling Arms hotel from 6 pm. Film screening at 7 pm, followed by more time to socialize and chat. “THE YES MEN FIX THE WORLD is a screwball true story about two gonzo political activists who, posing as top executives of giant corporations, lie their way into big business conferences and pull off the world’s most outrageous pranks. This entry was posted in Community, Event, Movies and tagged Monthly Movie, Stirling Arms Hotel, Yes Men Fix the World. Bookmark the permalink.